During his prime, Efrem Zimbalist was one of the world's most popular violinists, married to one of the world's most beloved sopranos. After conquering Europe, Zimbalist made an equally great impression on both American audiences and American critics; despite his celebrity, the artist maintained the high standards that had been his from the beginning. Zimbalist's father, an orchestra conductor, began providing music lessons when Efrem was but a child. At age nine, Zimbalist had progressed to the level of first violinist in his father's opera orchestra. Upon entering the St. Petersburg Conservatory at 12, Zimbalist was placed in the class of Leopold Auer, an atmosphere in which he thrived. At his graduation in 1907, the 18-year-old took the school's gold medal in performance in addition to the Rubinstein award of 1,200 rubles. A few months later, Zimbalist made his debut with the Berlin Philharmonic Orchestra, succeeding to a degree that brought offers from numerous other venues. In December, 1907, he performed for the first time in England and followed that engagement with appearances in many of Europe's most prestigious halls. Aside from critical acclaim, Zimbalist was honored by being asked to perform at Leipzig's Gewandhaus for the annual New Year's Day concert. During his tour, Zimbalist performed with such esteemed conductors as Hans Richter and Arthur Nikisch, winning their respect and admiration. Critics searched for superlatives, drawing on such expressions as "a genius among violinists" and praising his strong and vital tone. As to his technique, many described it as "perfection." Having won a legion of devoted followers in Europe, Zimbalist traveled to America where, on October 27, 1911, he made his debut with the Boston Symphony Orchestra. The work was Glazunov's Concerto in A minor, being given its first American performance, and Zimbalist's interpretation won heartier endorsement than the concerto itself. Nonetheless, the event was the first of many to establish the violinist as a favorite of the American public. In 1914, Zimbalist married soprano Alma Gluck; for a time, the couple toured together in joint recitals, but Gluck eventually retired to a domestic life. In 1928, Zimbalist accepted an offer to become a faculty member at Philadelphia's Curtis Institute of Music. While serving as head of the violin department, he continued to actively perform, appearing in nearly every major city on the globe. By 1940, he had toured the Orient seven times, once traveling more than 50,000 miles going across the Pacific to Australia, from there to other parts of the Far East, back to Australia, and thence to Europe before returning to the United States. Five years after the death of Gluck in 1938, Zimbalist married Mary Louise Curtis Bok, founder of the Curtis Institute. 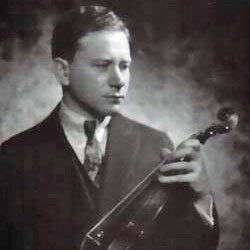 In 1941, the violinist was been appointed director of the school, a position he continued to hold until 1968 while championing the cause of early violin music. His farewell performances in 1949 and 1950 drew large audiences, many of whom regarded him as the finest violinist of his age. Zimbalist served as jury member for the Moscow Tchaikovsky competitions of 1962 and 1966. Well-regarded as a composer as well, Zimbalist wrote several symphonies, an opera, and a tone poem (Daphnis and Chloe), premiered by Leopold Stokowski and the Philadelphia Orchestra.